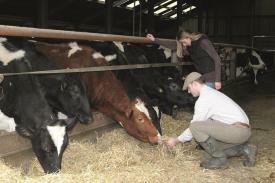 Feed advisers' advice maximises livestock health, welfare and productivity. FAR sets the standards for feed advice. The Feed Adviser Register (FAR) was established in May 2013 by AIC Services and key UK farm animal feed industry representatives. Its formation was a response to Governments need to reduce greenhouse gas emissions from farm livestock. That ambition, together with recognising the professionalism of the industry, led to the register's creation. There are now more than 1100 registered Feed Advisers. How do Feed Advisers qualify for FAR? For full Membership, Feed Advisers need at least 12 months' experience in an appropriate role and be able to demonstrate that they meet the FAR Core Competency requirements. Those with less experience can enrol as Development Members. After 12 months, during which their advice is supervised by a Full Member and they can demonstrate their competency, they can upgrade to Full Membership. Far membership is renewed annually and Feed Advisers must demonstrate their Core Competency (key knowledge criteria) by completing evidence templates, training presentations and i-validation questions. The scheme is independently audited and ongoing training is provided to ensure that Feed Advisers stay up to date with the latest developments. How does FAR benefit farmers? Farmers can be confident that registered Feed Advisers are competent to not only help them reduce emissions from livestock, but also to ensure they are implementing the best feed regime while increasing production efficiency.